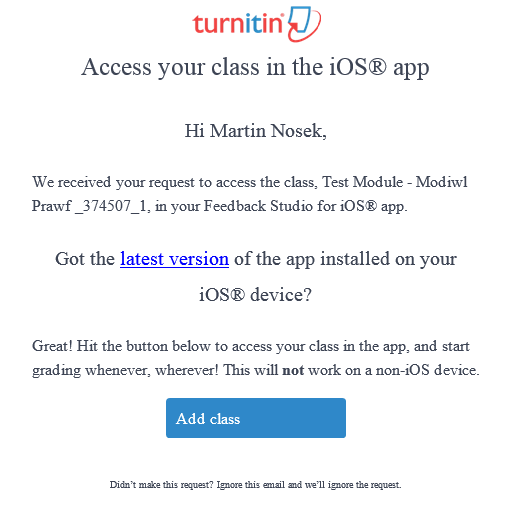 Recently, Turnitin has changed the way you open assignments (or class) within the Feedback Studio application on iOs (Apple) devices. If you use the Turnitin app on the iPad, please update your application to the latest version, and then follow one of these scenarios to access and mark assignments on your iOs device. Do you mainly use the desktop version of Feedback Studio and switch to the iPad application to finish marking at home (or somewhere else, without internet connection)? In this case you can use the information (i) icon in Feedback Studio (the desktop version), which can be found on the bottom of the right hand side panel. Here it will send you an email (fill in your email address first) with an access link to the Feedback Studio app. 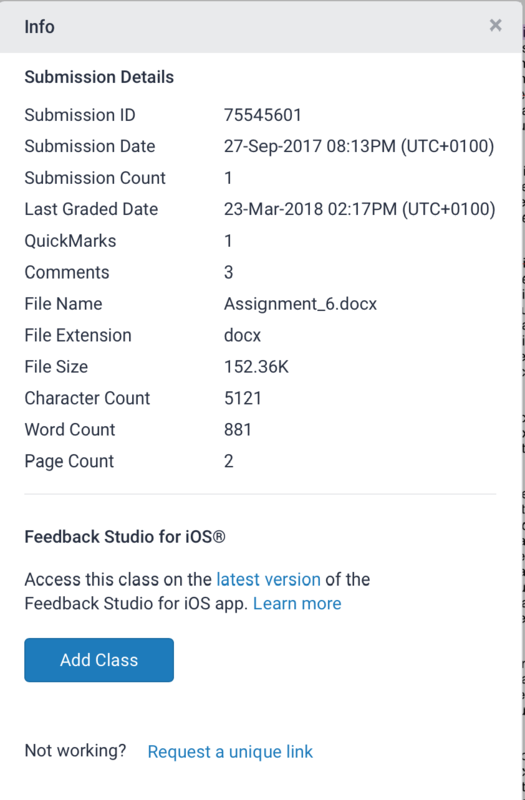 You will have to open this email on your iPad and click the link (add class), where it will open the application and give you access to your assignments. Do you only use the iPad for all your marking and feedback? In this case you can add a class straight from the Feedback Studio within a browser. Click on the information (i) icon (on the bottom of right hand side panel) again and then click “add class”. It will open the Feedback Studio application on your device where you can mark and provide feedback as usual. 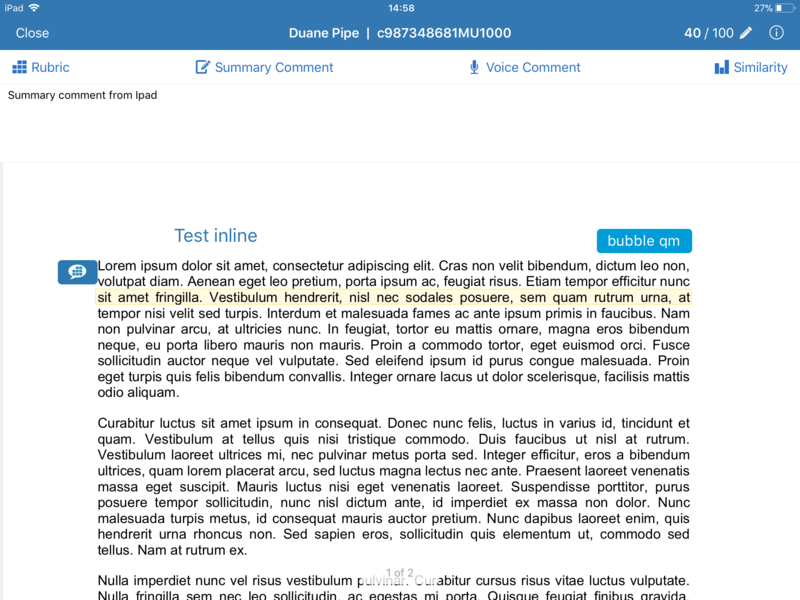 It is possible to select a portion of text and highlight in different colours with a bubble comment. 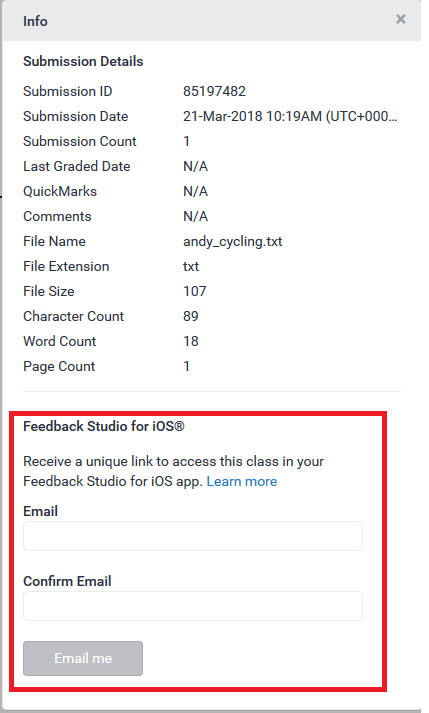 Personally, this new way to access your class in the Feedback Studio app is very straight forward if you use the iPad for all your assessments. The other way (opening via email) just requires that one additional step (opening your email inbox on the iPad) to gain access. Do you wish to start using the iPad to mark? Need some advice? Please watch this short video or get in touch with us at ceilt@cardiff.ac.uk.